I am a big fan of the staycation. In case you’re not familiar with the meaning, a staycation is a vacation at home. Literally. In. Your. Home. It’s easy on the budget, and it suits short holidays as it really maximizes your time (no excessive hours of travel required!). Plus, you can save more dollars in between your big holidays by incorporating an annual staycation into your life. And no, it’s not just a wasted vacation spent at home doing nothing in particular. Amazing times can be had on staycations. Memories can be made on staycations. And when planned properly and executed well, when it’s over you will probably find yourself already looking forward to your next home-based holiday. The staycation is a great, budget-friendly holiday option for singles, couples, or even families! So if you’re mad-keen for a vacation but your budget can’t quite swing the European adventure of your dreams just yet, don’t fret. The staycation is here to surprise you with its awesomeness. What will mark the beginning of your staycation? The moment you get home from your last pre-vacation day of work? The moment you roll out of bed the next morning? By choosing a clear start date, you mentally prepare yourself for vacation mode. It will help get your staycation off to a cracking start if you have pre-decided the exact moment that you’re officially on vacation. Likewise, choosing a clear end date will set a boundary for you to begin preparing to return to work and other real-life commitments. You wouldn’t fly all the way to Italy just to slump around in your PJs all day. So treat your staycation like the holiday that it is, and plan plan plan! What does every good holiday have? For me, it’s a combo of eating out, sight seeing and relaxing. So replicate that (or your equivalent of that). Be a tourist in your own city. Visit shopping districts further from home that you’ve been wanting to check out. Allocate quiet days in the house for recuperation. But don’t get to the morning of your staycation asking “what am I going to do every day?” I guarantee you will waste a lot of precious “holiday” time without a solid plan. Tip: Jump on Instagram and check out hashtags for your city. Or run a Pinterest search for “(your city) travel tips”. You’re bound to discover all sorts of gems you never knew existed! For our last staycation, we checked out an awesome cafe in our home city that I stumbled upon on Pinterest, and it was a serious highlight for us. A staycation is a budget-friendly holiday choice IF you plan your spending wisely. The dollars you save on travel and accommodation costs are easily frittered away if you don’t set clear spending guidelines. So plan out your itinerary and your budget alongside each other to avoid over spending. Budget-savvy tip: Pull out all your spending money as cash. Having a visual on every dollar you spend will help you to avoid over-spending when you see your funds beginning to dwindle. 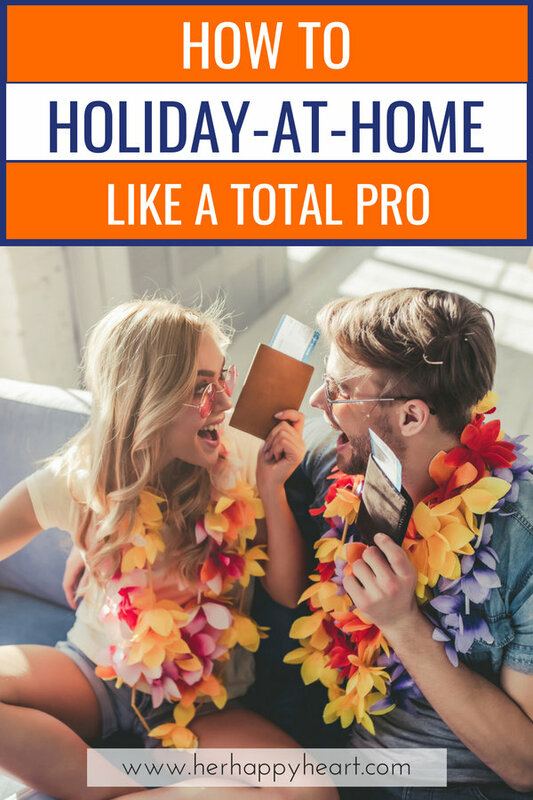 You could even set up separate bags or envelopes of cash for each day so you know that you won’t run out of money before the end of your stay-at-home holiday. You wouldn’t take time out of a road trip to pay your electricity bill or scrub the toilet, so give yourself the ultimate gift of a relatively chore-free vacation at home. Deep clean your house before you declare yourself “on staycation” and even consider hiring a cleaner to come in once or twice to add to that sense of freedom. Yes, you’ll probably still need to wash a few dishes and even do a load or two of laundry, but the more chores you can get ahead of, the better! If you’re one who loves a good pamper day on vacation, replicate the experience in your home city! For an easy option, book in a few treatments at a local day spa. If you’re feeling more creative, set yourself up at home! Make your own sugar scrub, hair mask, face mask and aromatherapy steamers (we have a delicious round-up of bath and beauty product DIYs that are perfect for beginners!). Diffuse some oils or burn a luxurious scented candle. Pop some slices of lemon and cucumber in a pitcher of icy cold water. You could even hire an at-home massage therapist or manicurist to come in for a special treat. You wouldn’t glue yourself to Facebook if you were 100 miles away, so show your staycation the same respect and put limits on your screen time. Don’t spend hours scrolling; perhaps reserve quieter evenings as a time to catch up on your social media channels and upload photos of your staycation adventures. A movie night or Netflix series binge is fine once or twice, but don’t waste all your precious staycation time stuck on the couch. There is a great life to be lived beyond our screens! Splurge on a few luxury items that you would expect to find in a hotel, but wouldn’t usually stock at home. Items like fancy hand soaps (this sampler set is totally gorgeous), little chocolates on pillows, linen sprays (you can make your own easily with these instructions), and a plush hotel-style bathrobe are some obvious choices that will help replicate a hotel stay. But while you’re at it, why not pick up a couple of bottles of fancy champagne, a cheese sampler or a full-blown gourmet gift basket? My personal pick is this 40-piece sampler of hot cocoa pod selections from Two Rivers. A cup of hot cocoa every night to wind down in the patio sounds like bliss to me! Load up your media devices with all the feel-good tunes that are sure to get you pumped. Let it be your constant staycation soundtrack – when you’re driving, when you’re chilling at home, any time! If you listen to it enough, you’ll begin to associate some of those songs with the awesome time you had vacationing at home. I’m not a huge drinker but I do LOVE to indulge in a cocktail once in a while, especially when I’m on vacation. My husband Chris got given a set of mini cocktail mixers for Christmas, and next time we do a family staycation, I’m planning on making my through it! Sampling new drinks on vacation is a lot of fun (done responsibly, of course!) so consider picking up some mixers for yourself and being your own bartender at home! There are heaps of different kits out there, but I like this selection of classics such as appletinis, margaritas, mojitos and more. We probably aren’t all clamouring for those kitschy tourist-magnet souvenir shop key rings, T-shirts and plush toys, especially of our home town. But that doesn’t mean you should totally discount the idea of keeping a souvenir of your staycation. Souvenirs foster memories, and you want to fondly remember your holiday at home just as much as any other vacation. So amidst all your hometown adventuring, pick up something special that will help remind you of your simple staycation for years to come. A necklace from a Sunday market. A keep cup from a new cafe you tried out. A book from the second-hand bookshop you explored in the city. It doesn’t have to cost much, but it should be something you hold onto and enjoy for years to come. Eating happens to be one of my top three favourite things to do on any vacation, and a staycation is no different! You don’t have to eat every meal out on the town, but you should aim to enjoy a variety of food experiences. Eat out often (check Instagram hashtags or ask friends for recommendations beforehand). Hit up a gourmet deli and throw together a fancy antipasto platter to enjoy in the back yard. Order Uber Eats at home once or twice (AKA staycation room service!). Picnic somewhere epic. And don’t forget a spectacular wine or champagne you wouldn’t usually indulge in! Maybe you’re like me and you don’t need to be told twice to photograph and document every single moment of every day, or maybe you’re a little more camera shy. Either way, a staycation is a great reason to snap away more than usual. Take enough photos to fill a photo book or mini album and commemorate your staycation properly. Or if photos aren’t your thing, check out these other methods for recording and storing your best memories. 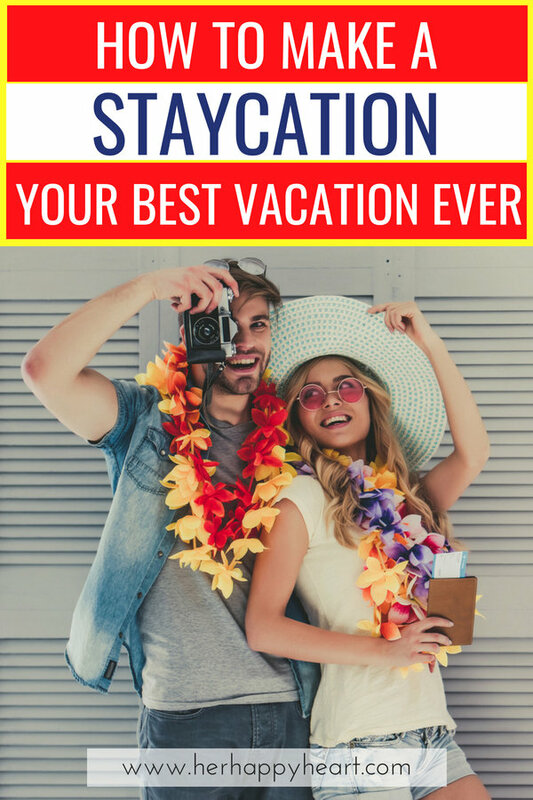 Maybe you haven’t considered taking a staycation to be a viable vacation option before, but I hope I’ve got you convinced! A staycation is what you make of it, so if you jump in treating it as a real-life, local holiday, you’re sure to have a wonderful break. You don’t need to travel in order to have a fun, relaxing break – so plan to stay home, save some dollars, and create some unique memories.